The very popular Melanie will be back with us in September with a timely talk about our nearest star, the Sun. In the year that sees the Parker Solar Probe launched to perform spectacular Sun science up close and personal, Melanie's talk will provide us with an appreciation of the star the probe has been sent to study. Chris' talk covers his passion in astronomy, the equipment he uses and the remote imaging set up, show many of the images taken whilst at the same time take you on a journey through space and time, starting with the closest object 400 light years away and ending with a galaxy cluster at 1 billion light years. We hope you will enjoy the talks' images, the fascinating Earth history, empathise with the trials and tribulations of the hobby, and be further stimulated to take even better photos. 5th Jul. 2018 John Whinstanley and Ashley Higgs: 'The Iridium Constellation and Iridium Flares'. John Whinstanley provides the insider's knowledge of the genesis and roll-out of the Iridium satellite constellation that was originally intended as the backbone of a global mobile telephone network, how its business model was overtaken by mobile phone technology and how it found itself a niche market that saved it from oblivion. 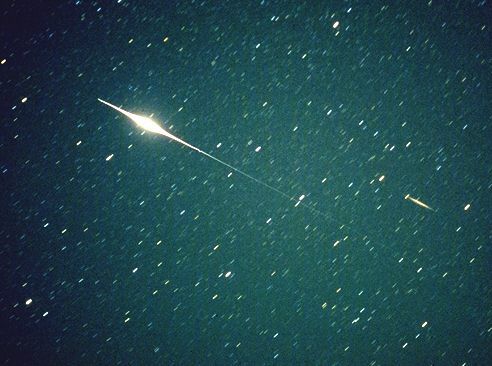 East Sussex AS member Ashley Higgs will tell us about the 'Iridium Flares', bright flashes of light seen from the ground when one of the satellites' panels reflects sunlight as it passes overhead. The ability to predict with uncanny precision the timing and location of these flashes in the sky has made them an astro-photographers delight and party-piece for those of us wishing to show off! Sadly, this constellation of satellites is in the process of being replaced by newer technology that doesn't 'flash' and the old satellites are, one by one, being de-orbited during this year to end their days with a last 'flash' as they burn up. We're busy planning the first hands-on telescope evening we've held for a long time. This will be a chance for members to bring their equipment along, set it up and have the opportunity to discuss with other members how to get the very best results from it. Don't worry if you don't have any equipment at all, are just starting out or if you are a seasoned astronomer-come along and share your questions and expertise. If it's a clear evening we'll brave the light polluted skies of Bexhill and see what we can observe! Our Society is extremely fortunate to have secured the legendary Professor Allan Chapman as our speaker for our 3rd of May meeting. Professor Chapman is a historian with an encyclopaedic knowledge of all things astronomical. But don't let the 'historian' bit put you off! Every talk of his I've been lucky to attend has been fun, fascinating, informative and, at times, hilarious. He can deliver an animated hour-long talk without notes, holding an audience's rapt attention from start to finish. As well as discovering some surprising Victorians from the well-heeled to the lowly and their contributions to the science of astronomy, in this talk you'll learn the real meaning of 'amateur' and why it's a term in which all of us that love astronomy can be proud. The exploration of the solar system has led to the discovery and study of volcanic processes on other worlds and in some very surprising places. What can this tell us about the formation of the planets and also about the prospects for the possibilities of life beyond Earth? Paul Fellows is co-presenter of the Public Open Nights at the Cambridge University Institute of Astronomy. These attract audiences of 200+ on a regular basis and are aimed to appeal to people of all levels from the complete beginner who wants to know where to start, yet hopefully adding something even for the more knowledgeable. Originally from Portsmouth, Paul came to Cambridge University in 1979 for his first-degree in Natural Sciences. He then joined the Computer Laboratory for his post-graduate studies and founded and grew several start-up companies in the Cambridge Hi-Tech scene, leading to successful share exits. He remains active as a board-advisor and consultant in that arena on a part time basis, but devotes the rest of his time to his life-long interest in Astronomy which began when he built an 8” Newtonian reflector aged 14 and experiencing the “wow” moment of seeing the rings of Saturn for the first time. These days he has his own private observatory where he images the sky, taking pictures of galaxies, clusters, nebulae and planets and using data from the Kepler Space Telescope he co-discovered a planet orbiting the star KIC9147029 which lies in the habitable zone of its parent star. He also is a Royal Astronomical Fellow in residence for Cunard Line and lectures on board the ships on a regular basis all over the world. He is a Fellow of the Institute of Engineering and Technology and of Royal Astronomical Society. He is also Chairman of the Cambridge Astronomical Association – the largest local amateur association in the UK. Now the perceived destination for deep-space explorers, Mars has received unprecedented attention from unmanned orbiters, landers and roving vehicles over the last 50 years - and more are planned for the next decade. But just what do we know about this enigmatic world and is it likely that there was ever life on the Red Planet? And what is the origin of its aged surface and where are we likely to find water - key essentials for the building-blocks of life? Just two of the questions for which we will attempt to find ways to locate answers. David Baker received his PhD in Earth and Planetary Science in the United States, specialising in lunar geomorphology, moved to do a couple of engineering degrees and worked for NASA on the Gemini, Apollo and Shuttle programmes. During the 1970s and 1980s he spent considerable time in many countries in the Far East for NASA advising on space applications. He has written more than 100 books on space activities, was editor of Jane's Space Directory between 1998 and 2005 and is now Editor of Spaceflight, the monthly magazine of the British Interplanetary Society. David regularly appears on TV, radio and podcasts and was voted a member of the International Academy of Astronautics in the 1980s, receiving the Rolls Royce Award in 1998, the Sir Arthur Clarke award in 2008, and the American Astronautical Society Lifetime Achievement Award in 2017. He lives in East Sussex with his wife Ann. Paul is a Fellow of the Institute of Engineering and Technology and of Royal Astronomical Society. He is also Chairman of the Cambridge Astronomical Association – the largest local amateur association in the UK. Cassini-Huygens is one of the most successful international space missions. 35 years ago, a small group of US and European scientists conceived the idea of an American orbiter of Saturn delivering a European probe to the moon, Titan. NASA and ESA eventually took up the idea and in 1997 Cassini-Huygens was launched to arrive in Saturn orbit seven years on. The Huygens probe descended through the clouds of Titan, to land on January 15th 2005. Using regular gravity assists from Titan, Cassini has continued in orbits customised for science targets until, in April 2017, it started a series of 22 orbits taking it inside Saturn’s rings finally to be crushed by the atmosphere in September 2017. The speaker built an instrument for the US mother ship, Cassini but then found himself heading the ESA team landing the Huygens probe on Titan. The Cassini mission ended on September 15th (19 years and 11 months after launch) with the planned crash of the spacecraft into Saturn’s atmosphere. David, a planetary scientist, is chairman of the Steering Board of the UK Space Agency and Senior Research Investigator at Imperial College. He had an academic career as a space scientist at Imperial College, London and in the USA. In 1997, he left academia for the European Space Agency to draw up what has become the current architecture of European Earth Observation space programmes (Living Planet and Copernicus). In 2001 he made another major change in career and became Director of Science at ESA, taking responsibility for all Astronomy and Space science missions. He retired from ESA in 2011, returned to Imperial College. He is currently chair of the Steering Board of UK Space Agency. He is a past president of the Royal Astronomical Society (2012-2014), a Fellow of the Royal Aeronautical Society and a member of the NASA Jet Propulsion Laboratory Advisory Council. We were very sorry to learn that Brad Gross, who was to be our speaker at December's meeting, has passed away following a short and unexpected illness. Our thoughts are with his family and his colleagues at this difficult time. He was an exceptional person and will be missed by everyone who was fortunate enough to know him. We think Brad would have wanted our meeting to continue, and Will Joyce and Melanie Davies (both long-time colleagues and friends of Brad's) have kindly agreed to present a talk in his place. Space Dogs, The True Story of Russia’s Canine Cosmonauts’ tells the true story of all 48 dogs and the scientists who were given the task of sending an animal into Space in preparation for Yuri Gagarin’s historic flight. This presentation features rare images and footage leading up to and beyond Laika’s tragic flight of November 3rd 1957, and it includes artwork and music from around the globe that was inspired by Laika, making it an informative, sensitive presentation suitable for all ages. A life-long stargazer, Caroline has been involved with the South Downs Planetarium in Chichester for fifteen years, is a member of Mid Kent Astronomical Society, and has given regular talks, workshops and astronomy evenings in schools around Kent and Sussex. She has had astro-images published, as well as being guest astronomer in The Namib Desert. Melanie brought us up to date with the magnificently successful Cassini spacecraft mission to Saturn! With the end of the mission on the 15th Sept Melanie brought us up-to-date Cassini news and images/video including items only 3 days old. If you wanted to see that Wave at Saturn image that Melanie spoke about in that full high resolution version you can find it at nasa.gov. To find out more about this mission go to https://saturn.jpl.nasa.gov. We also had William Joyce present a fascinating talking on 'The Mystery of the Ice Volcanoes' in our second half. A comparison of the planet Earth volcanic systems against the rest of the solar system moons and planets with some surprising and unexplained findings.